Nissan points out to us that their all new 40kw 100 per cent Electric Nissan Leaf has charged ahead in the sales charts this July. In excess of 300 new Nissan LEAF’s were registered during the month which heretofore would have been close to the total number of electric vehicles sold in a full year. 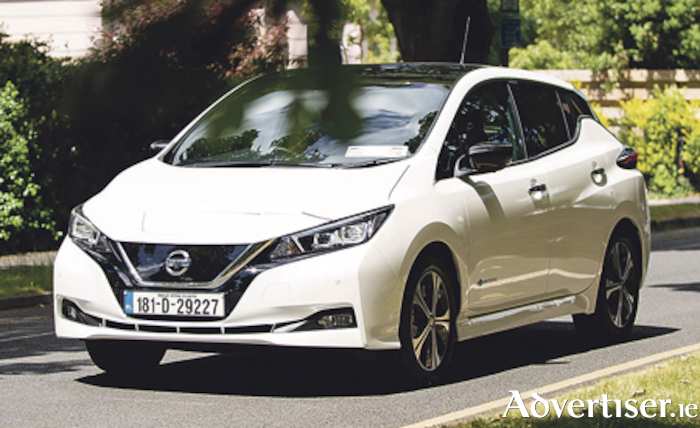 The July sales result brings the total number of Nissan Leaf driving on Irish roads to date to over 2,700 units cementing Nissan’s dominance and leadership in the fast emerging electric vehicle market. Nissan said that the unprecedented demand for the new Leaf is being driven by the fact that its range on a single charge has increased by 50 percent to 378 kilometres (NEDC ) and also claims that there’s a growing awareness amongst Irish householders that switching to a new Nissan Leaf can help them to save significantly on the cost of running their car. Government incentives including the SEAI purchase grant of €5,000, the additional €7,000 SEAI grant for taxi drivers, the introduction of zero percent BIK on company vehicles, half price tolls and the environmental benefits of switching to a 100 percent electric car are also playing a big role in influencing consumers, according to Nissan. “This result for July is a real benchmark and provides huge encouragement for the future of electric vehicles in Ireland. We have been advocates for electric driving over the last eight years and it’s fantastic to see people starting to make the switch in numbers now. “Consumers are conscientiously weighing up whether the car can save them money. Our Leaf customers have shown us that they are at least €1,350 a year better off for driving the 100 percent electric Nissan Leaf and no other drivetrain – petrol, diesel or hybrid, can come close to delivering that level of running cost savings,” said James McCarthy, CEO, Nissan Ireland. The all new Nissan Leaf offers a significant update over the previous model with a higher battery capacity and more dynamic new styling. It also hosts more advanced technologies including ProPilot and the Nissan e-Pedal function, which allows drivers to start from a standstill, accelerate and brake and even bring the car to a controlled stop by using the throttle pedal.